A contract for the delivery of Mi-35 attack aircraft will be signed this month. 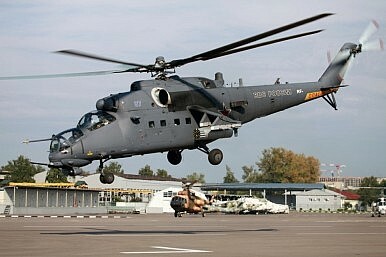 Russia is in talks with Afghanistan over the purchase of an unknown number of Mi-35 (likely the M or “Hind E” variant) combat helicopters, Sputnik News reports. Russian presidential envoy to Afghanistan and head of the Russian Foreign Ministry’s Second Asia Department Zamir Kabulov told a Russian newspaper that Afghanistan’s first Vice President Abdul Rashid Dostum has requested Moscow’s support to fight against ISIS insurgents. “We plan to conclude a contract with the Afghan side in October on the delivery, on a commercial basis, of several Mi-35 combat helicopters,” Kabulov said. The Afghan government already announced in April of this year, that it is interested in purchasing new Russian attack helicopters. “We intend to buy Mi-35 helicopters from Russia. This issue is on the agenda. I think we will begin negotiations on that in the nearest future,” an Afghan government official told Interfax back then. The Afghan Air Force currently is already operating five heavily armored older Mi-35 gunships supplied by the Czech Republic in 2008 but they are rarely operational. As I reported previously, the Mi-35M gunship, the export version of the Mi-24 gunship, was developed by the Mil Moscow Helicopter Plant and has been produced in Russia since 2005. Next to serving in the Russian military, the aircraft has been exported to Azerbaijan, Brazil, Iraq, and Venezuela. The Mi-35 is a close-air support aircraft and can be deployed against ground troops including armored targets, unmanned aerial vehicles, and other helicopters. The helicopter can be deployed for a host of different missions, including low-capacity troop transport (up to eight paratroopers), and medical evacuation missions. It can also carry military supplies weighing up to 1,500 kg internally and 2,400 kg externally. Russia will also provide military training for Afghan officers. “Russia is already providing certain assistance in strengthening the capabilities of the Afghan government forces,” according to Kabulov. “Afghanistan has an army and many Afghans are capable of bearing arms and know how to use them well. We need to strengthen the national potential, and not try to defend the Afghan government with foreign troops,” Kabulov said attacking the U.S. and NATO military presence in the country. To prop up Afghan air power, the United States has been rushing U.S.-made MD-530 F light attack helicopters to the frontlines as a stopgap measure due to delays in the delivery of 20 Brasilian-made Embraer EMB 314 Super Tucanos, aka A-29s, fixed-wing aircraft specifically designed for counter-insurgency operations (See:“Afghanistan’s Newest Attack Helicopter a ‘Total Mess’?”). In August 2015, Russia and Pakistan also signed an agreement for the purchase of four Mi-35 Hind gunships (See: “Confirmed: Pakistan Is Buying New Attack Helicopters from Russia”).